All in favor of forever honeymooning say I? (All hands go up!) I'm so excited to share the details on our recent trip to Belize for our honeymoon. When we were deciding on where to honeymoon we had three main criteria: tropical destination, reasonably close to Los Angeles, and somewhere we'd never been before. 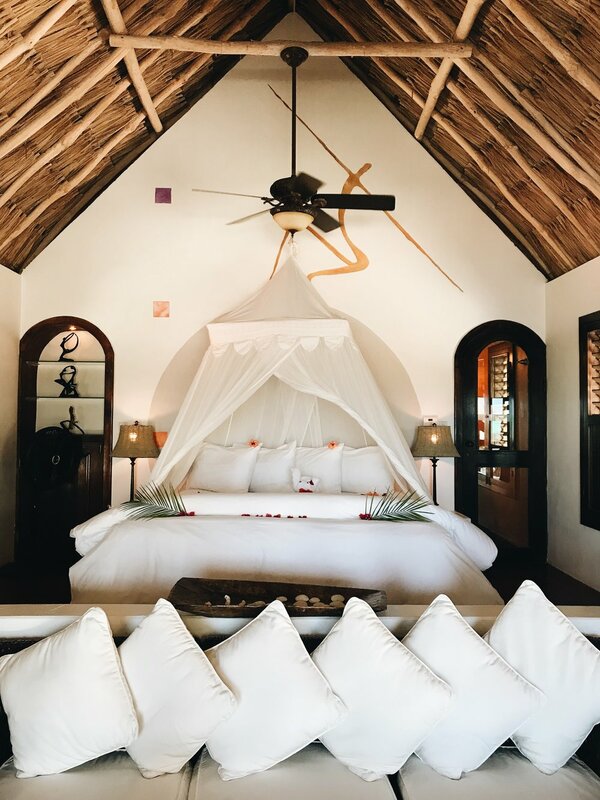 After polling the Instagram fam a few people mentioned Belize and one person suggested checking out the honeymoon package at Matachica Resort & Spa in Ambergris Caye. Cue the googling, Trip Advisor stalking, and geo-tag searches... 30 minutes later Andy had an email in his inbox from me saying "this is where where we're going on our honeymoon... k thanks!" Keep reading for my review of Matachica and sister lodge GAÏA , plus I'm answering your Qs about traveling to Belize. This should hopefully be V helpful for anyone thinking of going to Belize, not just honeymooners! When you talk to anyone who's traveled to Belize and/or do some googling of Belize vacay spots almost 90% of the results suggest somewhere on Ambergris Caye. That's because it's Belize's largest island and very close to the Belize Barrier Reef (the second largest barrier reef in the world!) which is a hot spot for snorkeling and dive sites. As I was looking at Matachica's Honeymoon Packages I spotted the Reef + Rainforest Honeymoon package which has you spending half the time in the Rainforest at GAÏA Riverlodge and the other half on the beach (Ambergris Caye) at Matachica Resort & Spa. My travel motto is to always try to experience the most in any given country and the package was super appealing to us because you truly get two VERY different worlds! On top of that, EVERYTHING is very scheduled out, taking the stress out of planning. As someone who just got finished planning a wedding in 4.5 months the last thing I wanted to do was plan every adventurous detail of our honeymoon, but I also didn't want us to sit on our butts for the entire week... honeymoon package for the win! Our cabana overlooked the waterfall and had two huge screened windows that we could look out of. There's no AC at GAÏAand although it gets pretty hot and humid during the day the temps drop at night and become very comfortable. I swear we both slept so well while we were there because of the white noise from the waterfall. Another thing to note is that there's little to no cell service and they offer wi-fi only in the main lodge which I personally think is amazing because it really allowed us to disconnect. Because the main lodge is also the dining room, we did find that a lot of people sat on their phones during dinner which was a bit of a bummer but to each their own. Our honeymoon package came with breakfast and dinner as well as a bottle of wine every night (my fave part obvi). For breakfast there was the typical offering: eggs and bacon, pancakes... plus some authentic entrees, fresh coffee, and fruit. I looked forward to breakfast every day because the Mayan Breakfast gave me LIFE. It came with the freshest tortillas I've ever had and the most delicious refried beans that had garlic in them. The dinner menu had a mix of seafood, meat and pasta and every night there was also a special. Our package came with 3 courses, so it's safe to say we were very full and satisfied every night after dinner. As part of our package we did a day trip of canoeing through the ancient Barton Creek Cave then zip-lining at Calico Jacks which was such a blast. Both stops are pretty often frequented when you're vacationing in that part of Belize and I 100% suggest them if you're staying in the surrounding area. Note "surrounding area" is literally a 1 -2 hr. radius - hah. Belize is SO vast and really not very built up anywhere like we're used to in the states, so there's a lot of large pockets of land between everything. Barton Creek Cave was a TRIP because we went pretty far into the cave and it was extremely dark and a little creepy at times (there's bats!). If you're at all claustrophobic I would NOT suggest it but if you're not, then it's a really fun adventure and you learn a lot about Belize during the ride. The second day we did a trip to visit the Caracol Maya archaeological site, the largest Mayan site in Belize, a stop at Rio Frio Cave and a refreshing dip at the Rio On pools. It was a jam packed day but really great to see so many different parts of the area. The nature there is NEXT LEVEL. Waterfalls and flowing rivers everywhere, birds chirping like you've never heard before, trees of all different types... for a city girl I was seriously in awe. The amazing thing about GAÏA is that they planned ALL of these for us (I believe you can get independent guided tours if you're not staying at the riverlodge) and it was fabulous. It was just Andy and I with our guide, Isael, the entire time. We became bff's with Isael, who's main hobby outside of work is birding; we learned so much about the birds of Central America that Andy and I were legit spotting and naming them when we got to our next stop in Ambergris Caya! If you're looking to just totally veg out at GAÏA then I would definitely suggest not booking a package and just doing a la carte excursions through them because the packages are all jam packed. We were up at 8am and back by 3 - 4pm for our two full days there. We knew that we wanted to start our honeymoon really adventurous and then make our way to beachside relaxation, so it was the perfect mix. I do wish we were able to spend more time at the GAÏA waterfall / landing area because it was truly magical. After our zip-line day we had a few hours before sunset to make our way down the 300 steps (or you can take a tram). Andy played in the water and I read in a hammock on the landing drinking a DELICIOUS cocktail. It was so serene - I felt like I was in the Jungle Book. Btw, at any given time I saw a MAX of 10 people during our stay at GAÏA; it's so tranquil and remote. The top three things we each loved about GAÏA! 2. Hydroelectric power - everything at the riverlodge is powered by the local river and waterfall which is amazing! 3. I'm super into towel animals and they killed it with new creatures every day! 1. That ambiance - I loved waking up and falling asleep to the sound of the waterfall. I've never been on a yoga retreat but I imagine one would be held at a place like GAÏA. 2. Lack of cell service - seems silly but it really helped me disconnect and get into vacay mode. 3. The staff - Derby (our waiter) and Iseal (our tour guide) are two people we will remember forever. The entire staff was so personable, accommodating, and just so welcoming. After three beautiful nights we packed up and headed to Matachica Resort + Spa in Ambergris Caye. This is when we took our first ever baby plane! 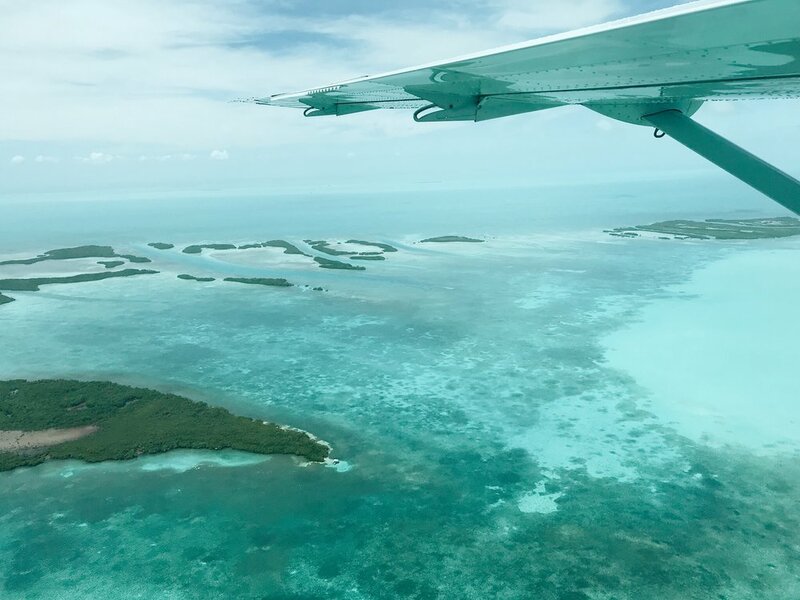 As part of our package, GAÏA provided ground transportation to Maya Flats airstrip and the Tropic Air flight from Maya Flats airstrip to San Pedro on Ambergris Caye. (I'm telling you, having this all planned for us was AMAZE!) Andy and I were both extremely nervous about taking such a tiny plane but we fell IN LOVE. A) they are SO MUCH more efficient than huge commercial flights B) the views are absolutely surreal! Tropic Air is the main airline in Belize so if you're traveling within the country you'll mostly likely fly with them. We ended up flying 3 times during our trip and really enjoyed it. While their website is seriously janky and could use an upgrade, the planes all seemed pretty new, pilots were very nice and prices are great. Andy and I actually joked that their pilots are more equipped to fly than huge commercial Airbus pilots. The Tropic Air flights are so short that these pilots are doing multiple trips a day, takeoffs and landings! After our adventurous time on the mainland we were very ready for some coastal relaxation! Once we landed in San Pedro, an employee from Matachica met us and we took a speed boat to the resort. Talk about a fabulous way to see the island and enter your new home for the next 4 nights! Matachica is a beautiful, bohemian resort. All the villas have hammocks on their patios and you could potentially spend your entire trip not wearing any shoes (my kind of beach vacay!). We settled into our ocean view villa quite nicely and especially loved that it had air conditioning. The weather during most of our trip was in the high 70s/low 80s with a lot of humidity (felt kind of like Miami) and by day 4 we were ready for some AC! There was actually a really great breeze going by the beach in the evenings that I needed to wear a denim jacket to dinner but nothing beats cold, non-humid AC while you're sleeping haha! We really got into relaxation mode during this part of our trip! I sat in one of the pods over the water almost everyday and ended up reading 4 books in 3 days - it was EVERYTHING. Pro-tip: get the coconut mojitos! The people: there's way more people at Matachica than GAÏA because a lot of tourists who are staying on Ambergris Caye flock to Matachica for dinner as it's one of the best dining spots in town. By no means is it crowded though just way more than the limited number of humans we saw at GAÏA The menu was pretty big with a mix of seafood, meat, and pasta. We had the same dining package that we did at GAÏA, so you bet I enjoyed those bottles of wine every night. I will say that 4 nights of eating at the same place can get a little bit redundant and I wish we would've explored another dinner spot, however, since Andy was a bit under the weather we stayed close to home. The day before we left Andy started feeling a bit better and we took advantage of the water toys they had available (all free if you're staying at Matachica) and paddle boarded and kayaked around. That afternoon we also rented a golf cart (btw, the MAIN form of transportation on the island is golf carts) and decided to drive over to secret beach which is a place a lot of people suggested we check out. First of all - getting to secret beach is CRAZY because the roads are equally as rocky and bumpy as the mainland but you're taking them in a golf cart not a landrover. Definitely an adventure but we made the best of it and brought along our Bose mini speaker (see my packing list here) and just jammed the whole way. To be honest I didn't love secret beach and am really not sure why there's so much hype. The water is much more clear and swimmable - I'll touch on that in the FAQs - but it's very crowded and gives me spring break vibes. When we got back we jumped into the pool at Matachica which was my second happy place after the ocean pods. Oh somewhere in there we also had a really fab couples massage! The spa at Matachica isn't as expansive as others (no sauna) but their therapists were amazing, probably one of the best massages I've received in awhile. That night we enjoyed a private candlelight dinner on your villa verandah which is SO romantic and memorable. Andy and I recapped how special the GAÏA and Matachica staffs made us feel during our 7 day trip. Belize will always hold a special place in our heart because of them! The top three things we each loved about Matachica! 1. Massage - it was much needed after our adventures at GAÏA at really relaxing. Also so nice to walk over in the sand, no shoes, lay down, get a great massage, then walk out to the beauty of the ocean again! 2. Hammock - I now think the key to happiness is your own personal patio hammock! 3. The water toys - while Ashley can lay in the sun for days on end just reading, I start itching for things to do, so I really enjoyed that Matachica had a bunch of us to use at our leisure. 1. It's a tropical paradise without being stuffy! Everyone is just so welcoming and professional, yet so casual which I love. 2. Over-the-water pods - I would've slept out there if I could. 3. The fact that I didn't wear shoes for almost 4 days except to venture off the property. That's my kind of living! Language: The official language of Belize is ENGLISH which makes it a fantastic place to travel to if you're looking for ease of communication. Most of the people we met also spoke Spanish and Mayan which is pretty incredible that they're trilingual. Andy was really happy to be able to practice his Spanish while we were there! Currency: The Belizean dollar. We were able to use major credit cards as well as US dollars everywhere, so there was no need to exchange money. Sometimes we would get a bill in Belizean dollars and pay in US (totally fine) but had to make sure we were doing the exchange rate correctly as you don't want to overpay. Safety: Never once did we feel unsafe. All of our transportation was scheduled through the Riverlodge + Resort and that is one of my main tips ANYWHERE you travel. It's so much better to do that then pick a random taxi even if the cost is a little more. As we were out with our guides and meeting with locals Andy asked about safety overall and many said that Belize City isn't the safest (gun violence) and even locals chose not to hang out there. From what I gather, tourists just fly in and then jump in their scheduled car to next destination, no reason to adventure in the city. Zika/Bugs: There are bugs. Belize has a subtropical climate which means there will be mosquitos and bugs. Andy and I brought with us a deet bug lotion (see in my packing post) that we put on every morning ad every evening before dinner. It worked pretty well as I usually get eaten alive and only got 5 -6 bites during the entire trip. We also didn't see any crazy bugs crawling around during our trip just cute lizards and geckos. When it comes to Zika that is an extremely personal decision. I come from the mindset that the media has blown it WAY out of proportion and even now doctors will say that IF you get it, you can get tested, and IF you have it you only have to wait 3 -4 months before trying to conceive. I'm not a doctor, so I suggest talking to yours if that's a concern. I will say that a bunch of couples came to our wedding in Los Cabos, got bitten A LOT, came home and tested negative for Zika. 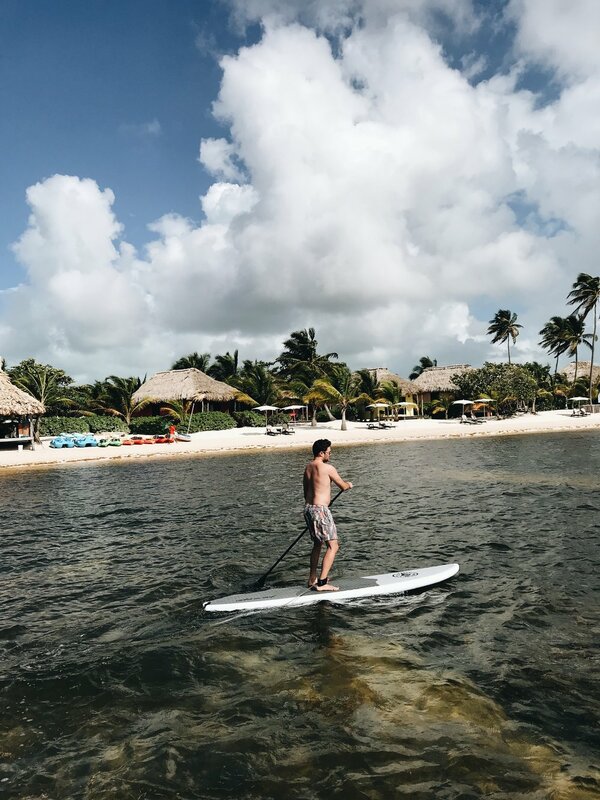 Sea Grass / Sargassum: If you've been thinking about traveling to the Caribbean, East Coast of Mexico, or Belize you've probably read reviews about the sea grass issues. There's tons of seaweed washing up on the shores (significantly more than past years some say due to global warming). Unfortunately it's nature and there's not much that can be done about it. Most resorts, Matachica being one of them, have a team clearing the seaweed all day, everyday. The bummer is that it makes the water (right off the coast) much less swimmable because there's tons of seaweed everywhere and on parts of the beach where it's not being maintained, it rots and smells. At actual Matachica I was not bothered by it because of the over-water pods and the pool - there was enough places to get my water fill. There are parts of the beach (north of Matachica) that aren't being maintained so you really can't go for long walks up the beach without hitting the big seaweed piles. Other: Belize is a gorgeous country with incredible people, however, it is extremely under developed even in their most "touristy" spots. Tons of articles say that will be changing in the next 2 -5 years as more people vacation there, however I sort of love the Belize we saw and experienced. It felt very organic and real. If you're someone who likes the Disneyland of resorts and high-end luxury, Belize is not for you just yet. If you guys have any other Qs about Belize PLEASE comment below and I'll answer. You can also always DM me on IG - @everydaypursuits. Got that travel bug? Yeah, me too!